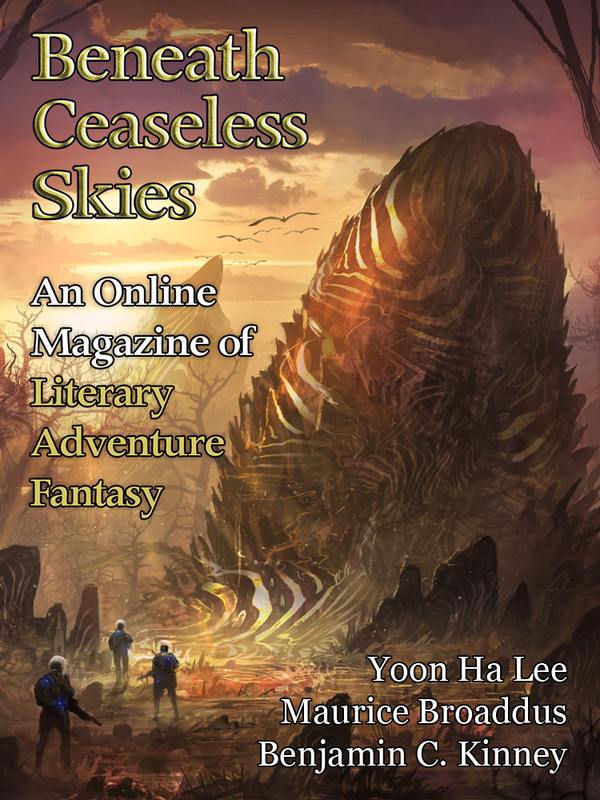 “The Starship and the Temple Cat” by Yoon Ha Lee, from BCS #244 , one of the three special issues for BCS Science-Fantasy Month 4 last February, is a finalist for the Sturgeon Award! 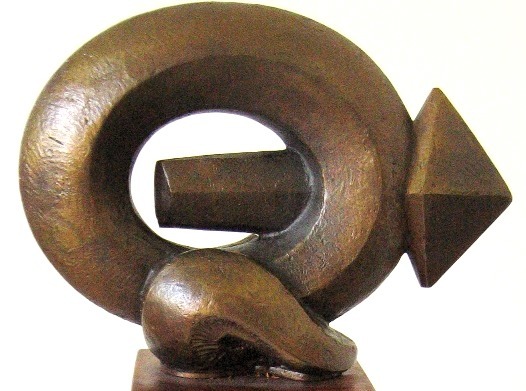 This award, in memoriam for legendary SF short fiction writer Theodore Sturgeon, is given every year for a great science fiction short story. Past winners include Kelly Link, Ted Chiang, and BCS author James Morrow (“Novel Excerpt: Galápagos Regained” in BCS #164 and podcast BCS 141). Congratulations, Yoon! “The Starship and the Temple Cat” shows one end of the range of short fiction that BCS publishes: science fantasy, with worlds as awe-inspiring and fantastical as our fantasy but technology and cultures that feel futuristic rather than pre-technological. Other finalists for the Sturgeon this year include BCS author P. Djèlí Clark (“A Tale of Woe,” BCS #253). Congratulations, all! To celebrate the tenth anniversary of BCS and Caroline M. Yoachim’s story “Carnival Nine” in BCS #225 and podcast BCS 196 named a finalist for the World Fantasy Awards, held later this fall, we’re giving away a signed copy of Caroline’s short fiction collection Seven Wonders of a Once and Future World & Other Stories! Caroline’s previous BCS stories, “The Land of Empty Shells” in BCS #20 and “Seasons Set in Skin” in BCS #177 and podcast BCS 156 (which is included in Seven Wonders of a Once and Future World & Other Stories), are about siblings and family, and “Carnival Nine” is about family and generations. 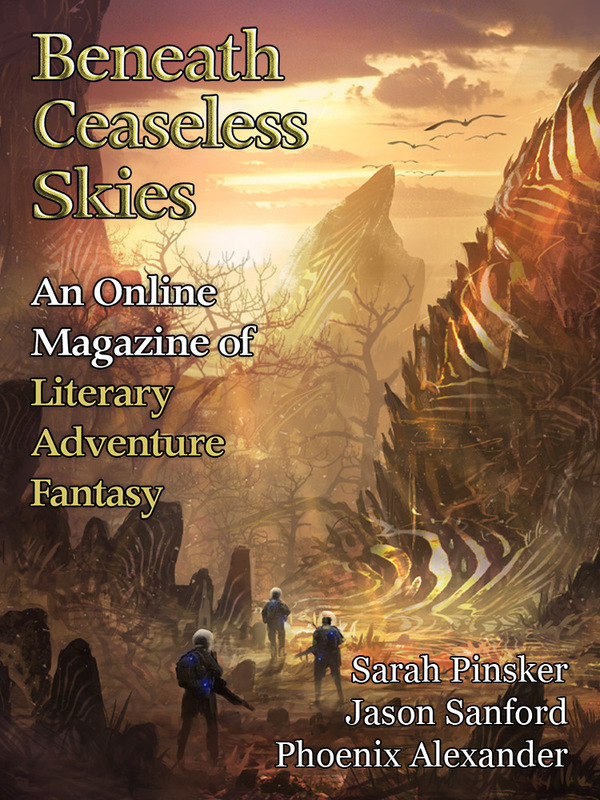 Seven Wonders has over twenty-five of Caroline’s stories through 2016, including literary fantasy, science fiction, fable-esque fantasy, and more. The giveaway for the signed copy of Seven Wonders of a Once and Future World & Other Stories will take place Monday Oct. 1 on the BCS Twitter feed @BCSmagazine. It will run from 2 PM EST until 5 PM EST. To enter, all you need to do is tweet what your favorite story from BCS about family is. Whether “Carnival Nine” or something else; a family story that’s charming or that’s dark, that ends happily or ends not-so-happily; with “family story” defined however you choose to define it. You must tweet your comment on Twitter. Comments left anywhere else will not enter you in the giveaway. You must mention the title of a work of short fiction that appeared in BCS. Comments that do not mention the title of a work of short fiction that appeared in BCS will not enter you in the giveaway. You must tweet your tweet between 2PM Eastern Standard Time and 5PM Eastern Standard Time on Mon. Oct 1, 2018. Any tweets posted before or after that will not be eligible. All entries will be entered in a random drawing to win the book. Each person will be entered only once in the random drawing (even if you post more than one eligible tweet). You must tweet your tweet from a valid Twitter account (otherwise we won’t be able to contact you if you win). BCS will conduct the random drawing from all eligible entries. The signed copy of Seven Wonders of a Once and Future World & Other Stories, signed to Beneath Ceaseless Skies, will be mailed to the winner. BCS is not responsible for tweets that get lost or don’t show up under @BCSmagazine, or email addresses that get garbled or otherwise rendered unusable for contacting an entrant, or for books getting lost or damaged in shipping. This promotion is in no way sponsored, endorsed or administered by, or associated with, Facebook or Twitter or anyone else. Participants are providing information to BCS and Firkin Press and not to Facebook or Twitter or anyone else. If you have any questions, feel free to ask them in this post or via our Contact page. Good luck! BCS Issue #250 Subscription Drive – Thank You!!! Thank you very much to all who bought a BCS ebook subscription during our 250th Issue Subscription Drive! We made our stretch goal, with a big surge on the last day (thank you! ), and our word-count limit for submissions is now 15,000 words. Thank you for making that happen. Thank you also to all who RT’d or shared or otherwise helped spread word, or bought gift subscriptions for other readers, or tweeted or posted about BCS #250 or stories or podcasts. That is a great help to us too; reaching readers with our stories and podcasts. We have many great stories forthcoming this summer and fall, from returning BCS authors and ones new to our pages, including K.J. Parker, Richard Parks, Chris Willrich, Margaret Ronald, Bonnie Jo Stufflebeam, Fran Wilde, Marissa Lingen, A. Merc Rustad, P. Djèlí Clark, E. Catherine Tobler, Tamara Vardomskaya, A.J. Fitzwater, Troy Wiggins, and many promising newcomers. We hope you enjoy them! BCS #250 is out today! A special double-issue in celebration of our 250th issue. K.J. Parker (“Told By An Idiot,” our 400th story, in Issue #192; “Heaven Thunders The Truth” in BCS #157, Six Anniversary Double-Issue) returns to BCS with “The Thought That Counts,” a classically Parker tale of wry erudite first-person, deft plot turns, and profound relationships. Margaret Ronald (“The Governess and the Lobster” in BCS #95, “Salvage” in BCS #77, among many others) returns to BCS with a fourth story in her series of war-veteran Arthur Swift and the kobold detective Mieni, “Silence in Blue Glass,” set at an earlier reunion of theirs. Bonne Jo Stufflebeam, whose most recent BCS story, “The Orangery,” was a finalist for the Nebula Awards, returns to BCS with “Angry Kings,” a tale of fables and family and expectations. The Parks and Ronald stories won’t go live on the website until next week, but they are available right now in the ebook of BCS #250, at Weightless Books and Kindle. The first BCS Audio Fiction Podcast episode for BCS #250 is BCS 216: The Thought That Counts, K.J. Parker’s tale of a wry first-person narrator negotiating obstacles legal and lethal. It’s guest-narrated by Heath Miller, who narrated BCS 178: The Limitless Perspective of Master Peek, or, the Luminescence of Debauchery by Catherynne M. Valente from BCS #200. The bonus BCS Audio Fiction Podcast episode, out next week, is BCS 217: An Account of the Madness of the Magistrate, Chengdhu Village, the latest tale in Richard Parks’s new series. It’s guest-narrated by Folly Blaine, narrator of many past episodes of the BCS Audio Fiction Podcast, including the previous two Parks tales in this series: BCS 203: On the Road to the Hell of Hungry Ghosts and BCS 197: In Memory of Jianhong, Snake-Devil. The From the Archives story with BCS #250 is “The Limitless Perspective of Master Peek, or, the Luminescence of Debauchery” by Catherynne M. Valente, from BCS #200, a sweeping tale of a richly voiced first-person narrator and their exploits and relationships via crafting magical glass eyes. We’re celebrating BCS #250 with a BCS Ebook Subscription Drive! 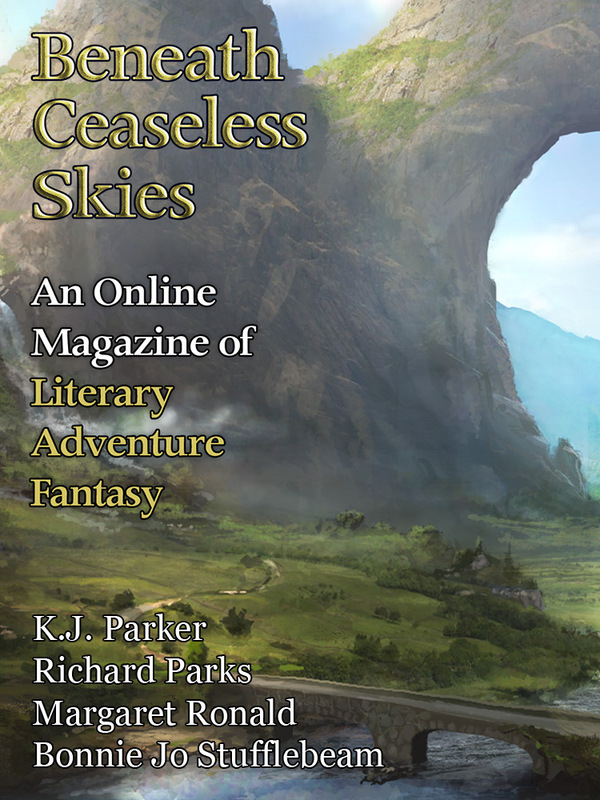 To see how subscribers get issues early, what great authors are forthcoming in BCS, and how you can help us reach our goals of raising our word-count limit, visit Weightless Books. All behind new cover art for BCS #250 and beyond: “Legendary Passage” by Jereme Peabody. BCS Issue #250 Subscription Drive! To celebrate our 250th issue, we’re having a BCS Subscription Drive! BCS ebook subscriptions, available exclusively at WeightlessBooks.com, are only $15.99 for a full year/26 issues (less than 30 cents a story). Subscribers can have issues delivered directly to their Kindle or smart phone, and they get new issues early, a week before the website. Subscribe now and you’ll get early access to new stories by K.J. Parker, Richard Parks, Chris Willrich, Margaret Ronald, Bonnie Jo Stufflebeam, Fran Wilde, Marissa Lingen, A. Merc Rustad, P. Djèlí Clark, E. Catherine Tobler, Tamara Vardomskaya, A.J. Fitzwater, Troy Wiggins, and many promising newcomers. Plus a Tenth Anniversary Double-Issue, two guest-narrated podcasts with BCS #250, awe-inspiring cover art, and more. From now until May 11, if you buy a BCS ebook subscription or renew your existing subscription (you can renew at any time), you can help unlock our drive goals. Since BCS #1 in 2008–250 issues, 525 stories!–over a third of our fiction has been novelette length or longer. 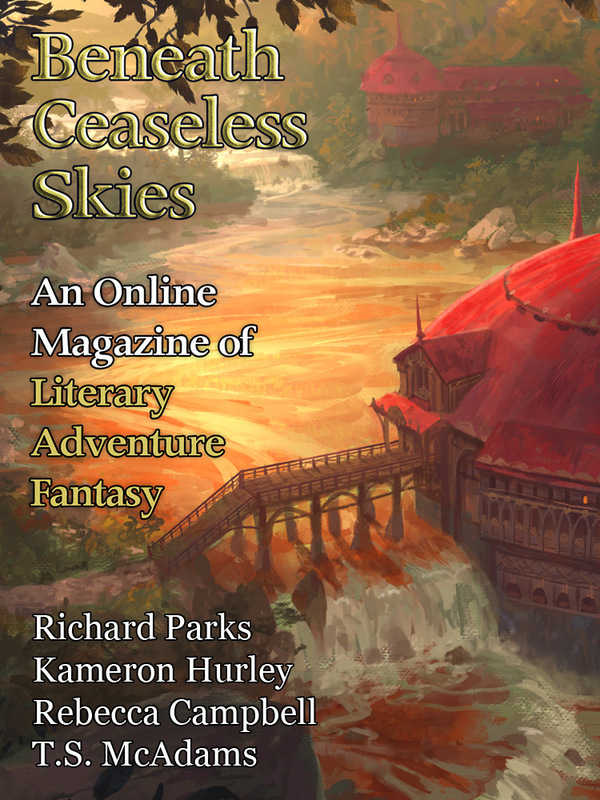 Longer stories work great for awe-inspiring fantasy worlds, like you’ll find in every issue of BCS. Our word-count limit for submissions has always been among the longest of pro-rate online magazines, and last year as a goal unlocked by our 2017 Subscription Drive, we made it even longer: 14,000 words. With your help, this year we’d like to make it longer still! At 50 new/renewing subscribers, BCS will raise our submissions word-count limit to 15,000 words. At 100 new/renewing subscribers, we’ll raise our word-count limit to 16,000 words. At 200 new/renewing subscribers, we’ll raise it to 18,000 words. At 250 new/renewing subscribers, we’ll raise it to 20,000 words! If you’d like to support BCS but you’re not interested in ebooks, please consider donating. We are a 501(c)(3) non-profit organization; your donation is tax deductible. We have ‘subscription’ donation options where you can donate a small amount every month. From now until May 11, every new monthly donor who signs up, we will count you in our Subscription Drive’s tally of new subscribers, and you will be helping us toward our Drive goals. Every subscription and donation makes a difference in helping us pay our authors for their great stories. Thank you for your support of BCS! BCS #246 is out, the third special double-issue for BCS Science-Fantasy Month 4. So much science-fantasy that Science-Fantasy Month is six weeks long! Sarah Pinsker (“The Mountains His Crown” in BCS #195 Science-Fantasy Month 3 and podcast BCS 171) returns to BCS with “Do As I Do, Sing As I Sing,” a story of duty and sibling rivalry among famine. Jason Sanford (“Blood Grains Speak Through Memories” in BCS #195 Science-Fantasy Month 3) offers “The Emotionless, in Love,” a stand-alone sequel to “Blood Grains Speak Through Memories,” focused on one of its ancillary characters, taken in by a band of survivors, who struggles with the strange powerful being he encounters and his own inner wounds. Phoenix Alexander offers “Gennesaret,” a tale of flight, determination, and principle. The BCS Audio Fiction Podcast with BCS #246 is BCS 212: Gennesaret, the Phoenix Alexander story of flight. It’s guest-narrated by M.K. Hobson, narrator of past BCS Podcast episodes such as BCS 208: Suite for Accompanied Cello by Tamara Vardomskaya, BCS 198: Two Bodies in Basting Stitch by Allison Jamieson-Lucy, and BCS 176: Laws of Night and Silk by Seth Dickinson. All behind a new, final crop of our special science-fantasy cover art: “Ugg” by Florent Llamas. BCS #245 is out, a second special double-issue for BCS Science-Fantasy Month 4! Rich Larson (“The Delusive Cartographer” in BCS #187, “The King in the Cathedral” in BCS #166 and podcast BCS 144, “The Mermaid Caper” in BCS #119) returns to BCS with “Penitents,” a story of battling compulsion from an immense alien presence. R.Z. Held offers “Red Dreams,” where a character and her mission partner must survive a post-apocalyptic woodland and her own deadly magic. Milo James Fowler offers “The Last Human Child,” another tale of post-apocalyptic survival, and Josh Pearce “Such Were the Faces of the Living Creatures,” a strange vision of a post-apocalyptic world and its people. All behind a new crop of our special science-fantasy cover art: “Ugg” by Florent Llamas. BCS Science-Fantasy Month 4 will continue for four more weeks, with a third issue (so much science-fantasy that BCS Science-Fantasy Month 4 will last a month and a half! ), including stories by Jason Sanford and Sarah Pinsker! BCS #244 is out, a special double-issue kicking off BCS Science-Fantasy Month 4! Yoon Ha Lee (“Shadow’s Weave” in BCS #200 and podcast BCS 177, “Two to Leave” in BCS 174 & podcast BCS 151, “The Pirate Captain’s Daughter” in BCS #27 & podcast BCS 025, among many others) returns to BCS with “The Starship and the Temple Cat,” a story of two disparate survivors of war. Maurice Broaddus offers “El is a Spaceship Melody,” a story of duty and starship and music, and Benjamin C. Kinney offers “Where the Anchor Lies,” a tale of unique attachment between officer and ship. The BCS Audio Fiction Podcast episode with BCS #244 is BCS 210: The Starship and the Temple Cat, the Yoon Ha Lee story of survivors of war. It’s guest-narrated by Michael J. DeLuca, BCS author and narrator of past podcast episodes, including BCS 168: Foxfire, Fofxire, Yoon Ha Lee’s Locus Award-finalist story from BCS Science-Fantasy Month 3. The ‘From the Archives’ story with BCS #244 is “The Breath of War” by Aliette de Bodard, from BCS #142 – Science-Fantasy Month 2 and podcast BCS 121, a story of motherhood and yearning and starships. All behind special science-fantasy cover art: “Ugg” by Florent Llamas. BCS Science-Fantasy Month 4 will continue for the next six weeks, with two more issues (so much science-fantasy that BCS Science-Fantasy Month 4 will last a month and a half! 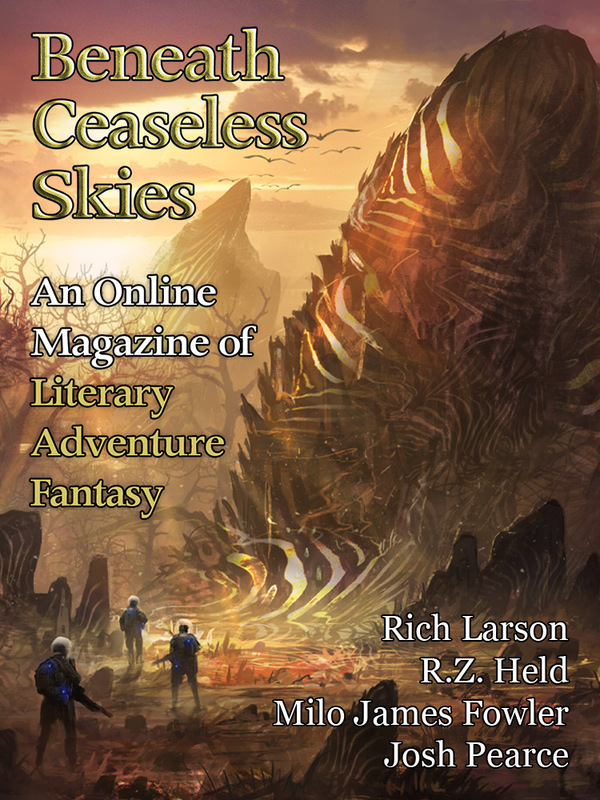 ), including stories by Rich Larson, Jason Sanford, and Sarah Pinsker! BCS #235, our Ninth Anniversary Double-Issue, is out today! Richard Parks (a dozen previous stories in BCS, including Lord Yamada tales such as “The Ghost of Shinoda Forest” in BCS #63 and standalone pieces like “In the Palace of the Jade Lion” in BCS #100) continues the new series he began in “In Memory of Jianhong, Snake-Devil” in BCS #226 and podcast BCS 197 with “On the Road to the Hell of Hungry Ghosts,” with the father-daughter ghost hunters and their new nonhuman companion encountering history and the supernatural. Kameron Hurley (“The Judgment of Gods and Monsters” in BCS #200) returns to BCS with “The Fisherman and the Pig,” another tale of the aftereffects of war, this time on a single person. Rebecca Campbell (“Unearthly Landscape by a Lady” in BCS #184 and podcast BCS 161) returns to BCS with “The Fall of the Mundaneum,” a likewise engagingly oddly voiced story, about history and isolation and an idiosyncratic archive. T.S. McAdams offers “Grassland,” a story of strange life and community in a strange prairie landscape. The Hurley and Campbell stories will release on the website on Oct. 5, but the full issue is available now on ebook at Amazon and Weightless Books. The BCS Audio Fiction Podcast episode is BCS 203: On the Road to the Hell of Hungry Ghosts, the Richard Parks story of the father-daughter ghost hunters encountering a strange new challenge. It’s guest-narrated by Folly Blaine, narrator of past BCS Audio Fiction Podcast episodes including BCS 189: Out of the Woods by Marissa Lingen, BCS 146: Sun, Stone, Spear by Carrie Vaughn, and BCS 197: In Memory of Jianhong, Snake-Devil, the previous story in this series. Our anniversary one-day ebook sales ended on Wednesday, but our new anthology The Best of BCS, Year Eight, featuring Catherynne M. Valente, K.J. Parker, Mishell Baker, Yoon Ha Lee, Aliette de Bodard, Rose Lemberg, Jason Sanford, and more is available at Amazon, B&N, iTunes, Kobo, and also Weightless Books (containing a 30% coupon for BCS subscriptions and issues). In nine (!) years of BCS, we’ve published almost 500 stories and 240 audio fiction podcasts. And there’s more to come! Thank you for reading!